Screenspares Impact Bars are used in heavy duty applications at conveyor belt loading points. 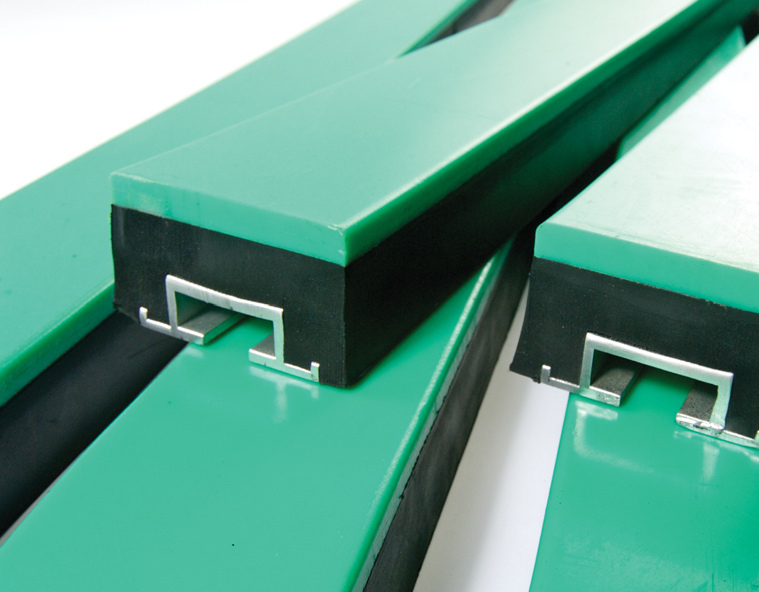 Impact Bars are designed to sit directly underneath the conveyor belt. The polyethylene top allows the belt to run over it with minimal friction while the thick block of rubber takes the energy out of the material at these points. Impact Bars are manufactured from a cast aluminium T-slotted base which is covered in a solid block of 60 shore hard rubber with a 10mm polyethylene top. Screenspares supply M16 x 40mm drop forged T-bolts as standard. Longer bolts available on request. Spillage significantly reduced therefore less downtime cleaning under conveyors. On most crushers, space is usually very limited which means replacing rollers can be extremely difficult which in turn increases downtime. The conveyor belt is supported on the continuous flat surface of the impact bars. Equal stress distribution reduces wear and tear on the belt.